If your wife has smooth legs, today and did not do professional hair removal treatments, she is probably investing lots of time and efforts being smooth and hair free. This means razor shaving or electric shaving her legs and body. Waxing may be even a higher sacrifice of agony to have smooth skin. You can give her a present she will love to use, and be very grateful. You may want to surprise her with a home hair removal machine. Buying a home hair removal system, is easier and less complicated than most people think. There are dozen of devices and systems, and in this post we will give you the tips how to pick the most suitable system for your spouse. There are two technologies which are somewhat similar, Laser and IPL. Laser is exactly what you think, a beam of laser which zaps the skin, it’s narrow and powerful, and creates heat which disables the hair growth. IPL is very similar but its a flash of intense light, (like a camera flash) which does the same effect, creating heat which disables hair growth. There is only ONE true laser hair removal system, which is called TRIA Laser. All the rest are IPL devices. The main difference is that laser is more powerful and some say more effective. The con is that laser treatment process is slower, because the pinpoint tip covers only 1 cm² per pulse. So covering a full leg takes an hour. So you know your woman, if she is precise, calm, can do slow and accurate work, than the TRIA may be a good solution, for a full body hair removal. The TRIA Laser 4X model, comes in colorful designs, cordless, and a bright display. Click here and buy her a TRIA Laser 4X. The TRIA has a smaller device called TRIA Precision which is used for body touch ups, like arms, underarms, facial, and bikini line. So if you want just a nice small palm size device, this will be it. Click here and buy her a TRIA Laser TRIA Precision. If your woman is tanned, or has dark skin, brown or black, then the TRIA is not suitable for her, and will may not operate at all. Laser or IPL will work only on fair skin and dark or brown hair. Laser and IPL are NOT meant for dark skin or tanned, or for removing white, blond body hair. The light needs the hair to have some pigment in order to zap it. IPL technology is similar to laser, IPL has other pros which makes them more popular than laser. The treatment window is wider and treats more skin in each pulse of light, so the treatments are quicker. The IPL is less painful than laser, and the systems cost less too. There are plenty of systems to pick from, we will give you here three choices, which are similar, and all are a great gift for Valentine’s Day. The price range is similar too, so it doesn’t really matter which one you pick. 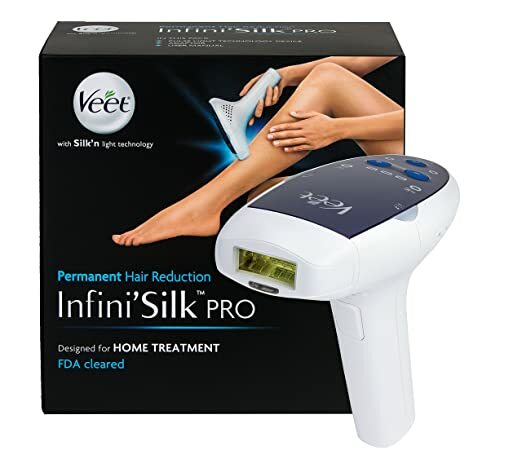 Veet Infini Silk – This is a new system, which comes in two models, a regular and a ‘Pro’. The ‘Veet Infini Silk Pro‘ is a hand held device, which zaps the hair through the yellow window. Veet is a well known brand for hair removal creams, and it decided to move to the home systems. The Veet Pro system has 5000 light flashes, in a replaceable cartridge. This is a great system for 4 full body hair removal sessions. Click here to buy your girl the ‘Veet Infini Silk Pro’ from Amazon. There is a smaller system, which is more compact, called: ‘Veet Infini Silk’ (without the “Pro”), which is designed for small areas touch ups like underarms, bikini line, arms and facial hair. The system has 50,000 flashes, installed and once they are over you need a new device. But don’t let that scare you 50,000 flashes are like 40 full body treatments, when about 6-8 are needed. Click here to buy the Veet Infini Silk as a gift. Remington IPL 6000 USA is one of the best selling IPL systems at Amazon. With thousands of devices sold online. It has a base unit and a hand held applicator, and comes with 2000-5000 flashes installed in the replaceable lamp. The device has an FDA clearance and is just as good as the two systems above. There are several types of Remington IPL iLight 6000 USA and price tags which depend on the IPL flashes installed. Many people buy the device with another lamp so they can complete the 4-8 treatments needed for effective hair reduction. Click here to get the Remington IPL 6000 USA as a Valentine’s Gift. Like laser, non of the IPL are safe for dark skin or blond hair reduction. If you look for a Valentine’s Day hair removal gift for a tanned woman, do not buy Laser or IPL! The only technology which is safe for dark skin is ELOS. The Me my ELOS is the only device FDA approved for black skin hair removal. Click here to buy the ELOS system as a Valentine’s Day gift. It is currently the BEST hair removal system for home use. It’s faster, less painful, more convenient for treatments, with a lamp of 150,000 flashes!! With three attachments (shaver, epilator, facial adapter). This entry was posted in Body Grooming, IPL Hair Removal, Laser Hair Removal News, Uncategorized and tagged 2015, How To Choose a Home Hair Removal, how to shave, Valentine's Day, Valentine's Day Gift by admin. Bookmark the permalink.